State Road 688 travels across Pinellas County as an urban arterial from Indian Rocks Beach to north St. Petersburg. The route takes 5th Avenue east from SR 699 (Gulf Boulevard) to the Indian Rocks Drawbridge across the Intracoastal Waterway (The Narrows). Beyond there, SR 686 follows Walsingham Road through west Largo to Ulmerton Road. Ulmerton Road swings the route northward one mile to 119th Street. 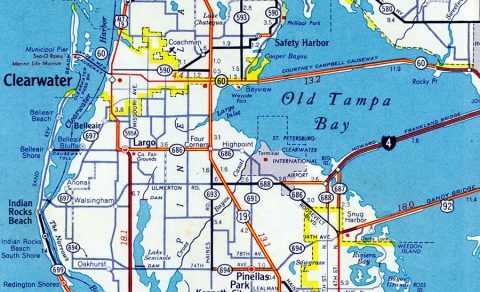 The remainder of Florida 688 east through Largo to northern reaches of Pinellas Park, unincorporated Feather South and north St. Petersburg at the merge with I-275 north. Ulmerton Road varies between six and eight lanes, with a short overlap presently with SR 686 between Roosevelt Boulevard north and south near Feather Sound. During the 1950s, SR 688 ran east only between Roosevelt Boulevard south (SR 686) and Haines Road (SR 693). An eastern extension was made to the Howard Frankland Bridge approach by the 1960s, along with a north-south branch along 9th Street North linking the end of I-4 with SR 686 (Roosevelt Boulevard) in St. Petersburg. By 1971, SR 688 was extended west along Ulmerton Road to Walsingham Road and the intersection of Florida Secondary 694 (Oakhurst Road) with Florida Secondary 697 (Indian Rocks Road) north. By 1965, Florida 688 formed an L-shaped route from Florida 693 (Haines Road) east to I-4 and south to Florida 686 (Roosevelt Boulevard). The north-south branch is now a part of County Road 803. Walsingham Road leads west from Walsingham County Park to become SR 688 west at the end of Ulmerton Road. Photo taken 05/12/14. A second junction sign for SR 688 appears as Walsingham Road intersects Ulmerton Road. SR 688 extends Walsingham Road west to Hamlin Boulevard and the Indian Rocks Drawbridge. Photo taken 05/12/14.